Besides being sweet herself, Julia is always great at coming up with the perfect sweet little treat at the right times when they are needed most. Her latest was artful as well as luxurious, and above all, delicious. A trio of small chocolate shots, each with its own distinct character. You intrigued yet? I sure was. The first was a plain dark chocolate, melted perfectly into that smooth consistency required of a drinking chocolate. Julia had melted it in the microwave to make it this time, but I have seen her do it on a double boiler as well. Given how well it came out in the microwave, with the perfect level of thickness and smoothness, I would personally never bother with the conventional method. To this first shot, no larger than a small bathroom cup, she added a generous dollop of whipped cream and a few chocolate sprinkles. This was the perfect addition to the chocolate, making it taste comforting and refined, like the fanciest shot of hot cocoa imaginable. Plus she knows I'm a sucker for whipped cream. For the second of the three petite shots, she toasted up some coconut in a dry pan for several minutes until it was lightly browned and crispy. She used the same melting chocolate in each of the shots, but put a small heap of the crunchy coconut on this one instead of the whipped cream. This gave it a nuttier, earthier feel than the first, but was just as delish. Finally, Julia went over the top to wow me with the third shot. Malted milk balls! 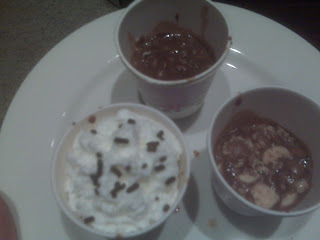 She took a few malted milk balls and crushed them up to create the topping for the third shot. It was an ingenious decision because the bits of malted milk ball that went in the warm chocolate melted a little and allowed their soft, malty flavor to permeate throughout. But what's the milk ball without the crunch? Never fear, there was still a nice crunchy layer on top that had not melted. This sent me over the moon with love for the third shot as well as with the entirety of the treat. Ten minutes by Julia in the kitchen, with a dollop of creativity and that all-important dollop of whipped cream made us pretty happy campers for the rest of the evening. Isn't that what a great treat is meant to accomplish? If not, then I might have to coin a new word for Julia's.